Avenida del Puerto is a 2.5km long road connecting the Plaza de Zaragoza with the port. The Plaza de Zaragoza is situated just next to the old riverbed, linking the two main streets of Marqués del Turia and Aragón. Although not strictly in the centre, it could be said that the Avenida del Puerto connects the city centre with the port. Today, it is a very wide street with 4 lanes, not including separate lanes for buses and taxis. It is a one-way street, travelling towards the city centre. Avenida Baleares and Calle Islas Canarias run parallel to Avenida del Puerto, travelling in the opposite direction, and are a means of travelling towards the city centre. The Avenida del Puerto first opened to traffic in 1802 in order to facilitate the transport of goods between the centre and the port. In the beginning, many warehouses, factories, and workshops lined the street. 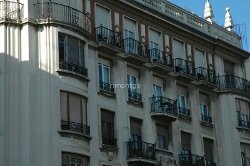 At the start of the 20th century, coinciding with the 1909 Valencian Regional Exposition, the avenida took on a more residential character. Nowadays, this residential character has taken over the area. The port of Valencia is the biggest in Spain in terms of commercial traffic, and one of the ten biggest in Europe. Its importance is shown by the number of passengers that it receives (normally travelling to the Balearic Islands or Italy), and its increased instance of cruise ships, proving that Valencia has become an unmissable stop for passengers. The new Marina Juan Carlos I, constructed for the America’s Cup, is situated in the northern part of the harbour, next to the Arenas beach. 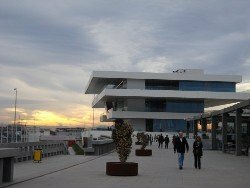 As well as over 800 moorings, the success of this renowned institution is proven by its building, ‘Veles e Vents’, an architectural wonder designed by David Chipperfield and Fermín Vázquez, has become the iconic symbol of the America’s Cup in Valencia. The length of the Avenida del Puerto means that the street can look completely different depending on which section you live in. One end is very close to the city centre, and the other is right next to the beach. The fact that the Avenida del Puerto is a very fast road means that, despite the length, one can travel from one place to another in a very short time period. It also benefits from a well-connected public transport system. At first glance, it looks as though Avenida del Puerto does not have a lot of bars and restaurants, but there are restaurants of all description in the adjacent streets from the most traditional to contemporary and exotic, from hidden-away gems to Michelin-starred eateries. Located all along the beachside promenade are a number of prestigious restaurants specialising in Valencian cuisine and eating paella on the seafront is a pleasure shared by many Valencians. Clearly, the close proximity to the port means that it is very easy for the restaurants to acquire the best seafood and fish. Another advantage of living on the Avenida del Puerto is having the beach nearby; a luxury that can be benefited from almost every day of the year thanks to the glorious Valencian weather. The city’s beaches, Arena and Malvarrosa, are wide with fine sand and bathed in the temperate waters of the Mediterranean. It was on these beaches that celebrated artist Joaquín Sorolla painted many of his masterpieces depicting Valencian lifestyle between the end of the 19th and the beginning of the 20th century. The Arenas beach is located at the northern end of the port, and further north still is Malvarrosa. Arenas beach is of clear urban character, and stretches 1.2km in length. At 60m wide, this is a beach that guarantees enough room for all the beachgoers. Malvarrosa beach is the most treasured beach in Valencia. It is a little larger, stretching 1.8km, and boasts 60m width with fine, golden sand, similar to that of Arenas. If we follow the coastline to the north, we come to Patacona, which, despite belonging to the latter part of Alboraya, is practically another Valencian beach.